So merge sort is a divide and conquer algorithm. While I was looking at the above diagram, I was thinking if it was possible to basically bypass all the divide steps. If you iterated over the original array while jumping by two, you could get the elements at at index i and i+1 and put them into their own sorted arrays. 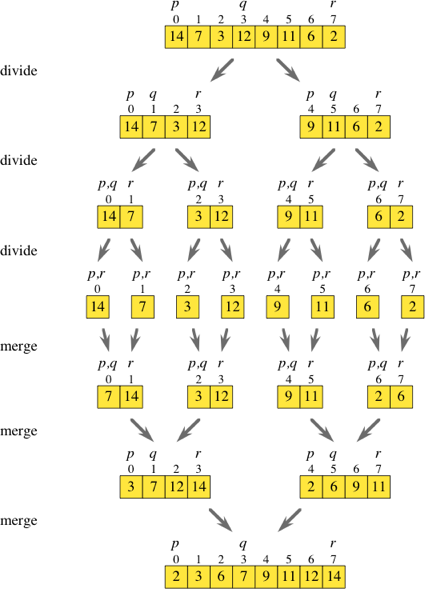 Once you have all these sub-arrays ([7,14], [3,12], [9,11] and [2,6] as shown in the diagram), you could simply proceed with the normal merge routine to get a sorted array. Is iterating through the array and immediately generating the required sub-arrays less efficient than performing the divide steps in their entirety? The confusion arises from difference between the conceptual description of the algorithm, and its implementation. I guess what you mean is the bottom-up implementation. In the bottom up implementation you start from single cell elements an move upward by merging elements into larger sorted lists/arrays. Just reverse the arrows in your figure above starting from the middle array, i.e., one-element arrays. Also, you may want to optimize the merge sort by dividing arrays until they reach some constant size, after which you simply sort them using for example insertion sort. Otherwise, sorting without splitting array is not possible. In fact the gist of the Merge sort is dividing and sorting subarrays, i.e., divide-and-conquer. Not the answer you're looking for? Browse other questions tagged algorithms sorting efficiency mergesort or ask your own question. Does my Algorithm Qualify as MergeSort? Is the outer loop in typical bubble sort algorithm precise?